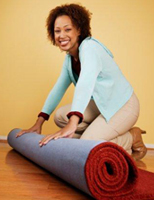 Excels have introduced a carpet and rug cleaning service. Traditional rugs are the products of hard work, requiring great skill and patience. More than just being mere articles of everyday use, they are decorative pieces of art, very much like a fine painting; pleasing to the eye. It is also an investment, which with time and care will increase in aesthetic value. As such Excels understands the value of these rugs and have invested in specialist cleaning facilities to ensure these rugs are cleaned delicately and look at their best. All types of rugs, oriental-design rugs, contemporary hand knotted and machine made can be professionally cleaned using Excels cleaning plant. As rugs are cleaned in Excels cleaning plant, this service is only provided for collectable items and is not offered for "fitted" carpets. Carpet and rug cleaning charges are based on carpet area (m2) and include a free collection and delivery service. Please contact Excels offices for advice on calculating charges.